This last Thursday I had the pleasure of being toured around several art exhibition openings by the artist Shila Khatami, who I am interning for as a part of Bard College Berlin’s Internship Seminar. After a long bike ride through the suburban haze of Pankow, I finally reached Kreuzberg. I met with Shila at a café across from her studio on Oranienstr. We had a coffee before entering into her studio, located behind a Turkish mosque and two clubs. The first show we went to was Achim Riethmann’s opening at the Gallerie Russi on Luckauer Str. The small gallery was filled with both young gallery-goers and older, seasoned patrons. Most people were congregated on the street in front of the gallery. Riethmann showed his large watercolor paintings, which are so precise they feel more like drawings than paintings. One must get close to the works to see the watery brushstrokes that make up the composition. His work centers around figures. Most of the canvas is left blank, with only parts of the figures painted in. Large sections of the bodies are only implied. In many paintings, the clothing and accessories are present, while the flesh and faces are left white. The figures are active: In some scenes they throw objects. In others they seem to have masks on. I felt that they were rioting and that the art hinted at a political message. The next stop on our jaunt were two galleries near Checkpoint Charlie. The first was the Johannes Wald opening at the Daniel Marzona gallery. The space was much larger than the Gallerie Russi. It had a different vibe because of its largeness and the fact that the sun had set and it was night time. The Marzona gallery felt like a Chelsea gallery opening in New York City. There was a large open room with white light spilling onto the nighttime street, filled with the very rich older crowd and the hip younger generation of gallery patrons who have become so recognizable. Wald’s work is mostly sculpture. The pieces that stuck out to me were mashes of cement forms with ropes around them. The form of the sculptures reminded me a bit of John Chamberlain’s work, but the materials used to create the form are different. Chamberlain uses car parts while Wald uses raw, cement-like material. What most intrigued me about Wald’s work is the painterly quality of the cement, which has a fluid and flowing feeling. The hardened cement maintains impressions of its liquid form, which look like brush strokes. This gives the appearance of a painted stone. Across the street from the Marzona Gallery is the Meyer Riegger gallery, which was also having an opening that night. The front room exhibited the work of the artist Bjorn Braun. Braun’s work comprised large video projections that showed a surface so close-up that you could not tell what it actually was. Though the images were so close, they were crystal clear. 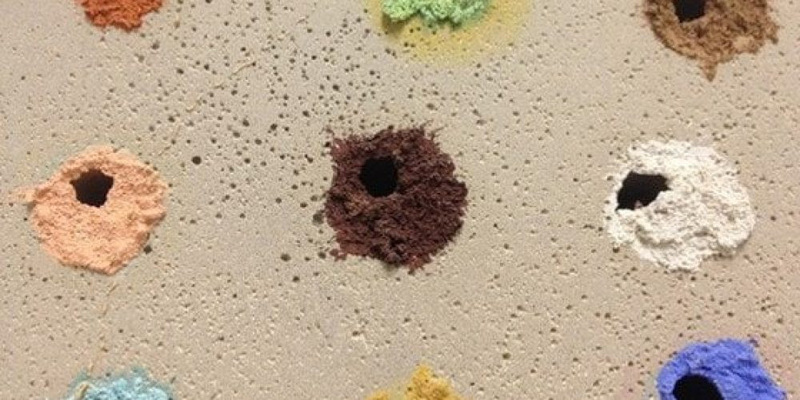 They were solid in color, with differently colored holes that almost looked like chewed up pieces of gum stuck onto a wall — though I’m sure they were not (see image above). At certain points in the video, bugs appeared. The bugs were the only movement. They were the only reason these projections were videos and not photos. The bugs moved slowly and smoothly. They did not cause any chaos as bugs often do. I do not usually like video art, but I really liked this work. The way they were so large, rectangular, undefined, and colorful made me feel like I was looking at abstract expressionist paintings. The subject was made abstract by the close perspective on the objects. Three of the four projections were in color, while the fourth was black and white. I thought this was a great choice. The addition of a colorless projection is what sparked my thought of abstract expressionism: The lack of color reminds us that color is an artistic choice. Braun is not simply documenting what appears before the camera, but controlling it. The other artist being shown at the Riegger gallery was John Miller, whose paintings span from the 1980s to the present. Unfortunately, I missed his work, but what I saw online looked excellent. I plan to return. I was pleasantly surprised by the quality of the work I saw that day. I have gotten used to plenty of contemporary art in New York that is not for me, and I was expecting the same in Berlin. The work I saw that day in Berlin was visually compelling. I would encourage anyone to check out these galleries. They encouraged me to continue exploring Berlin’s art scene. In addition to the art being shown, the event of the openings had a vibrancy. These art gallery openings should be on the radar for weekend nightlife because the events are more than a silent viewing of art. This vibrancy concluded perfectly with a social scene at the end of the Riegger gallery. The reason I missed Miller in the second part of Riegger was the beckoning backyard. It was getting late in the night and gallery-goers had been loosened up. The backyard adopted a party vibe as many younger people gathered. It started to feel like a fashion show. The gallery had a grill going and served Merguez sausages in Döner wraps. I sat down with a man who told me real Merguez is raw but that it is illegal here in Germany. If you go to France, they have the real thing. I was brought back to a Moroccan-French restaurant in my neighborhood back home — Manhattan’s East Village. They serve Merguez and Cous-Cous there, though I usually go for breakfast. What a fascinating review and description of an evening going to Berlin art openings. I liked the descriptions a of the scene and conversations.